[OSB Tracing] Outbound response was received. The problem here seems to be the faultcode element, since it holds the value 003. 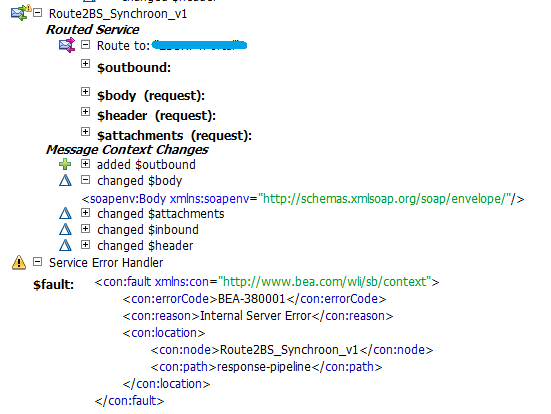 However the W3C SOAP standard only allows the values: Client, Server, MustUnderstand and VersionMismatch. And it seems the Oracle Service Bus is very strict about this. After some additional testing with SOAPui as service consumer we can see that the message also fails there. Remember that SOAPui by default does not perform these validations and you will need Assertions for that. This test (using a mockservice) shows that when the same response comes back with a valid faultcode the SOAPui assertions succeed. In the example we use the “.” seperator which is allowed and use Client as prefix since this is a valid faultcode. The OSB is strict regarding the W3C standards and therefor elements like <body> are protected. (This is also why you shouldn’t use the Assign action on the $body variable, but better use the Replace node content functionality). So the real reason of the problem seems that the external service sends an invalid SOAP envelope. In the past I had an identical problem with an endpoint that returned a HTML page (with some functional text information) instead of an expected SOAP message. Lessons learned: if you really want to know what you response looks like, enable tracing on the Business Service and examine the payload.